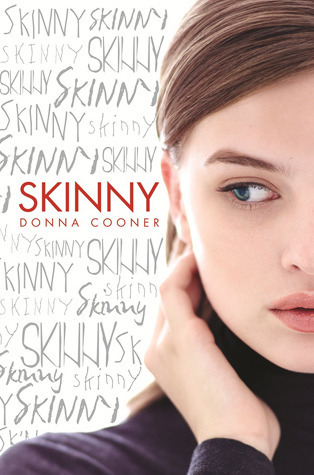 When I first heard about "Skinny" I knew it would be a book I would be reading almost as soon as it came out. The stories plot really grabbed my attention and the cover fits so well with what the book is about. I picked up a copy of the book up from my local library. I was so excited when I saw they had Skinny on their shelves. From the second picked up the book I began reading, so much so that I was kicked out of my library because it was about to close. Right away, from page one I was hooked. Ever makes the difficult decision to have the weight loose surgery, a gastric bypass in hopes to loose weight, look better and to finally fit it. She no longer wants to be laughed at, forgotten by the boy she loves, and most of all show everyone the true, Ever Davies. Will Ever find herself? Will she ever finally get to be the girl she wants to be? But mostly will "Skinny" fade away and let Ever truly SHINE?! Find out what happens when Ever undergoes this risky surgery and what changes within her along the way. Ever's journey of self-discovery will totally blow the reader away. Skinny made me laugh, cry, and hurt for Ever. I felt such deep emotions while reading. I was truly touched by this book. I could not put it down! The author put such feeling and rare emotions into her book. As the reader I felt I could see and feel exacting what Ever was feeling. When her chair broke during a assembly, and Ever fell on the floor while on stage. I felt like I was right there next to her; experiencing the same thing. Ever is such a strong and involved character. The hardships and struggles she had to endure were all so real and for me helped me feel like just because I myself is overweight that giving up is just not a option. I think for anyone who deals with weight issues, whether your an adult or a child/teen this book teaches you to always reach for your dreams no matter what may be in your way. It this case "Skinny" or her inner thoughts which plagued Ever throughout the book but in the end...Ever came out the winner. You are so much more that how much you weight. The ending was beautiful. From page one until I turned to the final page this epic story will always have a place in my heart. Wow nice review!! I have to admit when this first came out I dismissed it bc I don't really dig the idea of a teenager having weightloss surgery... but some of my fav. bloggers :) have given it great reviews so I'll definitely look for it at my library!